Known in years past as the “Paris of the East” and “Queen of the Orient”, Shanghai is China’s most populous and sophisticated city. Its infamous Great World Entertainment Center has been transformed into a modern state-of-the-art theater and Shanghai Youth Center. The wide boulevard known as the Bund was the centerpiece of colonial Shanghai and is a major part of the 21st century showcase that Shanghai has become. Shanghai (Chinese for on the sea) is a city in eastern China that is situated on the Huannpu River, a tributary of the Yangtze, near the Yangtze River’s mouth to the East China Sea. 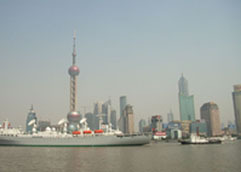 Shanghai is China’s main port, commercial hub, and industrial center. The words most frequently used to describe contemporary Shanghai are: prosperous and sophisticated. Its buildings and atmosphere are reminiscent of New York, London, and Paris. The old and the new dwell in harmony. Historic avenues and beautiful parks surround busy harbors and crowded streets. Pagodas, temples, museums, and cultural centers are all part of this bustling city. Shanghai recently hosted a Millionaires’ Conference for its many residents who now enjoy that income status. Modern Shanghai still retains many reminders of the past. Rich Eastern charm and Western flavor coexist in the best of both worlds. The population continues to rise, as people are attracted by Shanghai’s cultural opportunities, by her history, as well as by the pulse and the vigor which this world class metropolis displays. Opera, classical music, jazz, rock, jazz, theater, acrobatics, and dance are all featured on Shanghai’s cultural scene. Shanghai is the birthplace of the Chinese movie and hosts nine annual film festivals. The Shanghai symphony orchestra has long been held in high regard, and is one of the oldest symphony orchestras in Asia. The venues are striking in appearance and in capacity. The Grand Theatre and the Oriental Arts Centre have attracted top international productions. Traditional Chinese entertainment in the area of Chinese opera and acrobatics continue to delight large audiences as well. Recent years have brought dramatic changes to nightlife in Shanghai. New bars and clubs open almost weekly. A process of sorting has been occurring by which many new offerings are tried and tested with some closing soon after opening, only to be replaced by others (or reopened under new management) within a short period of time. Sports bars, comedy clubs, theme bars (Egyptian, Irish, glamour and fashion, Middle East, colonial, and others) are all part of the wide array of choices. The world’s third tallest broadcasting tower, Oriental Pearl Tower, dominates the city skyline from its height of more than 1500 feet. From its observation deck, visitors can enjoy spectacular views. Modern Shanghai Museum Park houses one of the most noteworthy collections of the Middle Kingdom and ranks among China’s four largest museums. 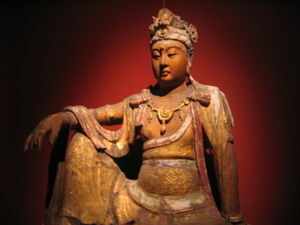 Ming and Qing dynasty art are also displayed, along with fine porcelain exhibits. The Huangpu River divides Central Shanghai into two distinct areas: Pudong (east of the river) and Puxi (west of the river). The best known attractions of interest to visitors are in Puxi, including the Bund, the centerpiece of tourism, (though not the physical center of town). West of the Bund is the former International Settlement and one of Shanghai’s main shopping streets, East Nanjing Road. South of the Bund is Old Town, a maze of narrow lanes and landmarks of the heart of the original city of Shanghai. West of this Old Town and hidden in the backstreets north and south of Huaihai Road (Shanghai’s premier shopping street) is the former French Concession, with its tree-lined streets, 1930s architecture, cafes, and bars. At its western end, in Xintiandi, is the more recently established collection of Western-style restaurants and bars. Continuing southeast, the way opens onto the massive shopping mall intersection of Xujiahui. Farther south is Shanghai Stadium. Pudong’s extremely rapid rise as a special economic zone of banks, glass and steel skyscrapers, and upscale residential complexes has been called miraculous. The spirit of this new area of Shanghai is best characterized by one of its modes of transportation: the Maglev Train. The Maglev travels at warp speed through an area that was farmland just 15 years ago. There is no longer a hint of its rural roots in this burgeoning commercial and residential district of soaring towers and five star hotels. World class museums such as Shanghai Municipal History Museum, Shanghai Aquarium, and the Science and Technology Museum are presided over by the lofty Oriental Pearl Tower. 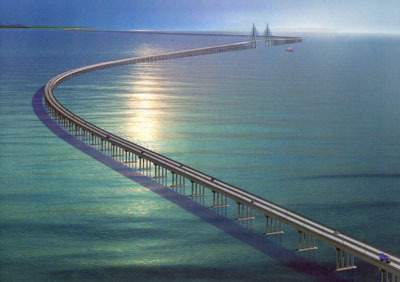 Pudong, justifiably, aspires to be the Trade and Finance Center of the Far East. Shanghai, the Eastern Pearl, is a welcoming and enchanting city and a fascinating vacation destination. Time Zone: Shanghai (and all of China) is on Beijing time, which is 8 hours ahead of Greenwich Mean Time (GMT + 8), 13 hours ahead of New York, 14 hours ahead of Chicago, and 16 hours ahead of Los Angeles. There’s no daylight saving time. Subtract 1 hour in the summer. Shanghai has hot, rainy summers and dry, cool winters. With an average daily temperature range of 32F to 90F, July is typically the hottest month. The average daily temperature range in January, the coldest month, is 33-46F. Shanghai has an average annual precipitation of 45 inches. June is the wettest month, and December is the driest. Telephone: Country Code: Shanghai’s area code is 021; the country code is +86. Shopping Specialties: Silk, cashmere, clothing, antiques, tea, electronics. With the opening of Shanghai’s Pudong International Airport on October 1, 1999, Shanghai became the first city in China to have two international airports. Pudong Airport is 40km from the city. 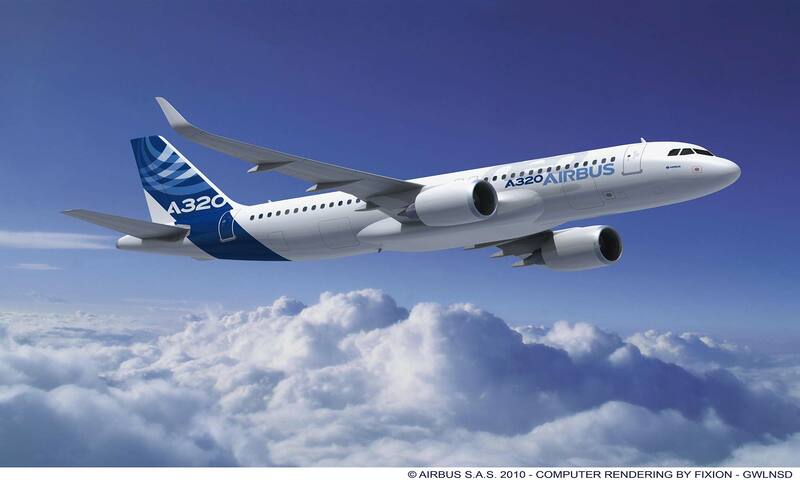 Passengers can take a special airport bus from Pudong Airport to the downtown area and Hongqiao Airport. Five bus lines operate on that route. There is also the Maglev train.. The bus travels from Pudong Airport to Hongqiao Airport; from Pudong Airport to the Shanghai Exhibition Center; from Pudong Airport to Zunyi Road; from Pudong Airport to Dongjiangwan Road; and from Pudong Airport to the Shanghai Railway Station. Buses operate from 6:00 to 19:00 in downtown areas and from 8:00 to 21:00 at Pudong Airport. Hongqiao International Airport is located in the western suburbs of Shanghai, only 13 kilometers away from the city center. Since 1996, Hongqiao International Airport has consecutively won the first prize among airport group with an annual passenger count of over eight million. The Shànghai subway system, an inexpensive and fast way to cover longer distances, is currently undergoing some much-needed expansion (from three, including the existing light rail line, to eight lines. During morning and evening rush hours and on weekend afternoons, the system is so overburdened that it is best to avoid riding the subway at those times. The still incomplete Metro Line 2 runs in an east-west direction from Zhongshan Gongyuán across downtown Shànghai, under the Huángpu River, and through Pudong’s most developed areas to Lóngyáng Lù, where Maglev connections can be made to Pudong Airport. There are plans in the future to extend the line eastward and westward to connect to Shanghai’s two airports. To locate subway entrances, look for the large signs with a letter “M”. . Subway platform signs in Chinese and pinyin indicate the station name and the name of the next station in each direction, and maps of the complete Metro system are posted in each station and inside the subway cars as well. In addition, English announcements of upcoming stops are made on trains. To determine your fare, consult the fare map posted near the ticket counters and on ticket vending kiosks. If you are going to be riding the subway often, purchase a rechargeable Jiaotong Card (Jiaotong Ka). The card can also be used to pay for bus, ferry, and taxi rides, with your fare being automatically deducted from the amount remaining on the card. Light Rail — By 2001 Shànghai had opened the first phase of its Pearl Mass Transit Light Rail line, which it plans to expand greatly by 2012.. Currently, its 19 stations encircle the western outskirts of the city, with stops at Shànghai Stadium to the south and at Shànghai Railway Station to the north of downtown. Phase two of the Light Rail will complete what’s started of this vast rail circle, extending the tracks across the river, through Pudong, and then back across the river into downtown Shànghai’s southern precincts. The aboveground Light Rail is clean, modern, and not heavily traveled except during rush hours. Ticketing is nearly identical to the Metro system’s. The Light Rail is seldom helpful for sightseeing, although it does stop near Lu Xùn Gongyuán (Hóngkou Stadium Station) and Duolún Lù cultural street (Baoxìn Lù Station) north of downtown, where the Metro lines do not extend. The Metro does usefully intersect with the Light Rail at the stations serving Shànghai Stadium, Zhongshan Park, and the Shànghai Railway Station. With over 40,000 taxis in the streets, this is the most common means visitors use to get around Shànghai. Taxis congregate at leading hotels but can just as easily be hailed from street corners. Few drivers speak English. Most taxis now post a passenger’s “bill of rights” along the back of the front seat. Some of the “rights” include a smoke-free taxi and a driver not distracted by a mobile phone. The general rule is never go with a driver who asks you your destination before you even get into the cab. Always have your destination marked on a map or written down in Chinese, as well as a business card from your hotel with the address in Chinese so you can show it to the taxi driver when you want to get back. Check to see that the supervision card, which includes the driver’s photo and identification number, is prominently displayed, as required by law. If not, find another cab. Make sure the meter is visible, and that you see the driver reset it by pushing down the flag, If traveling by yourself, sit up front and take out your map so you can follow (or at least pretend to follow) the taxi’s route. At the end of the trip, pay the indicated meter fare and no more. Tips are not expected. Public buses (gong gòng qì che are considerably more difficult to use, less comfortable than taxis or the Metro. Some buses have conductors but others only have money slots in the front of the bus with no change given. Be prepared to stand and be cramped during your expedition, and take care with backpacks and purses. Shànghai is not the best place to ride a bicycle. Prosperity has tremendously increased the number of cars. The bicycle is still the main form of transportation for millions of Shànghai’s residents and bicycle riding is challenging, but not impossible. A bicycle can be purchased at the large Malls. Be sure to also purchase and use a lock. Helmets are not required, but are advisable. Crossing the Huángpu River is necessary to enter the Pudong New Area on the east side of the river. There are seven basic routes. Three are by bridge, each handling around 45,000 vehicles a day. A fourth route (and the cheapest) is by water, via the passenger ferry. The ferry terminal is at the southern end of the Bund on the west shore and at the southern end of Riverside Avenue at Dongchang Lù on the east shore. Three more routes across the river make use of tunnels: The Yán’an Dong Lù Tunnel by car; the Metro Line 2 of the subway; and the Bund Sight-Seeing Tunnel (Wàitan Guanguang Suìdào) iby tram (daily 9am-9:30pm). The best way to see Shànghai’s sights and experience life at street-level is on foot..
Pudong Located across the Huángpu River from the Bund: Pudong was formerly farmland before 1990. Today, it is home to the Lùjiazui Financial District and includes the Oriental Pearl TV Tower, Jin Mào Tower, the Shànghai stock exchange, Asia’s largest department store, a riverside promenade, and the new Pudong International Airport. Huángpu (Downtown Shànghai) The city center of old Shànghai lies in a compact sector west of the Huángpu River and south of Suzhou Creek. It extends west to Chéngdu Bei Lù (the North-South Elevated Hwy. ), and encompasses the Bund, People’s Square (Rénmín Guangchang), and the Shànghai Museum. Nánshì (Old Chinese City) Though officially part of Huángpu District, this area immediately south of downtown and the Bund, between the Huángpu River and Xizàng Nán Lù, differs in every way from the westernized areas. Today’s old Chinese city (or Old Town) includes the Old Town Bazaar with its traditional shopping, Yù Yuán (Yù Garden), Shànghai’s old city wall, and the Confucian Temple. Hóngkou (Northeast Shànghai) Immediately north of downtown Shànghai, across Suzhou Creek, this residential sector along the upper Huángpu River was originally the American sector before it became part of the International Settlement in colonial days. Today it is a developing neighborhood with a few sights. There are the Ohel Moshe Synagogue, the Lu Xùn Museum, and the Duolún Lù Commercial Street. Lúwan (French Sector) Beginning at People’s Square (Xizàng Lù) and continuing west to Shanxi Nán Lù, this historic district was the domain of the French colonial community up until 1949. The French left their mark on the residential architecture. Local attractions: Fùxing Park, the Jin Jiang Hotel, the shops along Huáihai Zhong Lù, the new Xin Tiandì development, and the former residences of Sun Yat-sen and Zhou Enlái. Jìng An (Northwest Shànghai) North of the French sector and part of the former International Settlement, this district has colonial architecture, as well as the modern Shànghai Centre. Two of the city’s top Buddhist shrines, Jìng An Sì and Yù Fó Sì (Jade Buddha Temple), are located here, as are a number of Shànghai’s top hotels and restaurants. Xúhuì (Southwest Shànghai) West of the French sector and south along Héngshan Lù, this area is one of Shànghai’s leading locations for cafes, bars, and shops. Sights include the Xújiahuì Cathedral, Lónghuá Pagoda, the Shànghai Botanical Garden, and the former residence of Soong Chingling. Chángníng (Hóngqiáo Development Zone: Starting at Huáihai Xi Lù, directly west of the Xúhuì and Jìng An districts, this corridor of new international economic ventures extends far west of downtown, past Gubei New Town and the Shànghai Zoo, to the Hóngqiáo Airport. One of the two major commercial streets in Shanghai (in addition to Huai Hai Road), Nan Jing Road spans 5.5 kilometers east to west. There are more than 600 shops and shopping centers, covering both sides of the road. Once the premier shopping street, it has undergone a total renovation in recent years. New shopping centers have been erected and a large section on the eastern side has been pedestrianized. There are some first class hotels scattered along the road including the Peace Hotel, and the Portman. In the evenings, the street is illuminated. Transportation is convenient as visitors can catch the metro at various points along the road. Standing 468 meters high, the Oriental Pearl TV Tower is one of the highest towers in Asia. Tourists may climb the tower for panoramic views of the city. The ground floor features a shopping area, café, and an international city exhibit. It also offers deluxe conference rooms that have hosted leaders and VIPs from around the world. On clear days, the upper levels of this tower, measuring no less than 263 meters in height, offer spectacular views. This area includes the streets around Fuyou Street, Dongtai Lu and Henan Lu. Built in 1901, the six-kilometer-long Huai Hai Road commemorates the Huai Hai Battle during Liberation. Today, this road has become synonymous with what is trendy and fashionable in Shanghai. While the stretch between Shan Xi Road and Xi Zang Road is the busiest section (and best for people-watching), this commercial street contains more than 400 shops, restaurants and businesses. The remnants of French architecture give the street its cosmopolitan charm. Many nearby attractions add to its appeal, including the proximity of Doctor Sun Yat-sen Former Residence and Memorial Hall. This museum has five floors that detail the ambitious plans of Shanghai’s urban planners. Visitors are provided with a glimpse of how Shanghai will look in 20 years. The centerpiece on the third floor is a huge model of the city as it is now. The map on the first half floor, outlines the districts scheduled to be cleared for new construction. Green areas are marked. In the basement, a model of old Shanghai is on display, with house entrances, cobble stone ways, and operating shops and teahouses. The Museum occupies a heritage building, that once overlooked a racecourse. It is at the northwest corner of People’s Park. There are twelve exhibition halls on five floors showing modern and traditional fine art. The permanent collection includes paintings, calligraphy, and sculpture, but its rotating exhibitions have favored modern artwork. There is a museum store, café, and a rooftop restaurant. People’s Square (Ren Min Guang Chang) is a vast public square surrounded by government buildings. Truly an urban park, it features manicured greenery and, at its heart, the architecturally impressive Shanghai Museum. Other features include a 320-square-meter water fountain, subway station and an underground shopping mall. Because the square attracts many people, it makes an ideal venue for people watching. Add a carefree afternoon of kite flying. Kites are available at the square. This luxurious golf course is a 40-minute taxi ride from downtown Shanghai. The Great World Entertainment Center ranks among the oldest entertainment establishments in Shanghai. In existence since the 1920s, it used to cater towards the decadent tastes of some of the colonial settlers during that period and once housed a brothel and a gambling casino. Today, the entertainment is far more wholesome. Performances vary from Chinese gong fu to folk dancing to acrobatics and Beijing opera. A section for children’s entertainment keeps the children happy. This museum boasts 120,000 Chinese art pieces and archeological findings. Permanent exhibits feature bronzes, ceramics and paintings, among other artifacts. Other facilities include a library with 20,000 books, a conservation laboratory and a lecture room. There is an impressive gift shop on the first floor, a non-smoking teahouse and several antique and curio stalls. An audio tour is available in English and Japanese. The building itself is an architectural showpiece, resembling an ancient tripod when viewed sideways. The rooftop with glassed dome is modeled on a Han Dynasty mirror. Opened in 1997, this club features a spacious, 4,500 square-meter indoor track, so that speed racers get numerous chances to put their foot down on the gas pedal. Visitors can refuel and recharge at the trackside pub and cafe. Entry to the track is free, but there are costs to race. Formerly only showing the works of Shanghai’s popular modern artist, Ting Shao Kuang, the Gallery now showcases a wider range of artists. It is a branch of the AA Gallery, which has established a solid reputation locally (main branch is at the Shanghai Center). The Gallery aims at popular mainstream tastes rather than the avant-garde. Exhibitions change frequently. Located next to the Shanghai Grand Theatre and near the Shanghai Art Museum, it also sells original paintings and reprints of Chinese artists as well as foreign ones. Admission charged; children below 1.2 meters in height: free. This new and modern indoor aquarium offers visitors a glimpse of life on the ocean floor. Access to the exhibits is through an entrance resembling an Inca Temple. Schools of colorful fish are viewed against a backdrop of themes, such as a sunken pirate ship, mountain stream and rainforest. There are penguins and species representing all 12 of the Chinese zodiac animals. The aquarium features a touching pool, and tanks housing unusual crustaceans, sea horses, corals and anemones. The deep ocean and sea floor exhibit brings visitors face-to-face with sharks, sea snakes and other marine life. This fairly new library is ranked among the ten largest in the world. It seats 3,000 readers and houses over 13 million books, newspapers, journals, rare Western books, family trees, correspondences, and stone inscriptions. It is also honored as one of the ten symbolic cultural buildings in Shanghai. Technologically innovative, the library is the first in China to have an advanced information management system where coverage, cataloguing, circulation, continual publication and inquiry are done by computers. The library also provides online service for surfing the Internet or checking e-mail. This is one of the most venerated temples in Shanghai. Famous for its white jade Buddha, the temple was built in 1882 when a Chinese monk brought the figure from Burma. There are three ornately decorated main halls. The highlight is the Jade Buddha Tower where the bejeweled white Buddha is displayed. The massive figure weighs more than a ton. The white and red observation tower has watched over the Huangpu River since 1884. The base, now home to this tiny museum, was built 19 years earlier. Photos along the walls present the Bund’s most famous buildings, both past and present. People’s Square (Ren Min Guang Chang) is a vast public square surrounded by government buildings. Truly an urban park, it features manicured greenery and, at its heart, the architecturally impressive Shanghai Museum. Other features include a 320-square-meter water fountain, subway station and an underground shopping mall. Because the square attracts many people, it makes an ideal venue for people watching. Add a carefree afternoon of kite flying to your itinerary—great for the young and the young at heart. Kites are available for sale at the square. Standing 468 meters high, the Oriental Pearl TV Tower is one of the highest towers in Asia. Tourists may climb the tower for panoramic views of the city. The ground floor features a shopping area, cafe and an international city exhibit. It also offers deluxe conference rooms that have hosted leaders and VIPs from around the world. On clear days, the upper levels of this tower, measuring no less than 263 meters in height, offer spectacular views of the city. Performances vary from Chinese gong fu to folk dancing to acrobatics and Beijing opera. A children’s section provides activities for children and youth. Zhen Yang is a large and relatively new complex in Shanghai. It has 32 lanes and is in operation 24 hours a day. Peak times are set between 7pm and 11pm. Taking a boat tour along the Huang Pu River gives visitors an opportunity to see many of Shanghai’s famous sites such as the People’s Hero Monument, the Bund (Wai Tan), the Oriental Pearl TV Tower and the dramatic skyline of the Pu Dong business district. Also, in view from the river are the bustling International Passenger Station of Shanghai Harbor, the docks and the Wu Song ancient gun fort relics. Chinese New Year is one of the best known, the most widely celebrated and certainly the oldest New Year festivals in the world. Chinese communities all over the globe have made it a big event in their respective communities, but there’s no better place to witness the start of the new lunar year than in China itself. Chinese New Year, also known as the Spring Festival, falls on the first day of the first lunar month. The date changes in the Western calendar each year. The preparations start long before the event and the festivities last for around 15 days, ending with the Lantern Festival. In China the New Year is widely celebrated, and everything closes down, officially, for four days. People jam the transport networks to get home to their families. Preparations begin about a month before the day itself, building up to huge house-cleaning sessions to sweep out bad luck. Doors and windows are freshly painted – the colors for the festival are red (for happiness) and gold (for wealth) – and decorative paper cut outs and paintings are put up. Poetic couplets expressing wishes for happiness and longevity, written on rolls of red paper, are traditionally put on gateposts and doors. On the night itself, almost everyone in China holds a huge family dinner of seafood and dumplings, as well as the traditional New Year cakes. Then, at midnight, fireworks light up the skies all over the country. On the next day, people traditionally visit relatives, friends and neighbors with new year greetings (“Gong Xi Fa Cai”: “Happy and Prosperous New Year”), and married couples give Hong Bao (red packets of money) to children and unmarried adults. 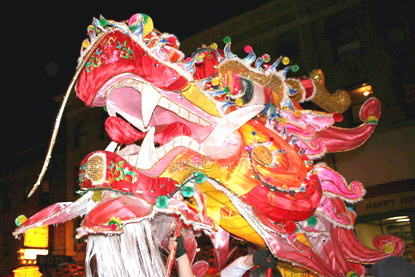 There are also high-energy dragon dances, lantern shows, and other entertainments throughout the celebrations. The streets of Shanghai light up at night during this huge festival as revelers walk about holding Chinese lanterns. Legend claims that the lanterns protect citizens from being attacked and hauled away by evil spirits lurking in Shanghai’s air space..
One hundred eight honored Buddhists ascend the Drum Tower in Longhua Park to strike the temple bell at midnight on New Year’s Eve each year. According to ancient Buddhist doctrine, each stroke of the bell represents one kind of earthly happiness. Chinese New Year, also known as the Spring Festival, falls on the first day of the first lunar month – the date changes in the Western calendar each year. The Longhua Temple is a great place to head for the event – it has always done its own spectacular thing for local worshippers and tourists alike. The temple’s vegetarian dishes are very popular with tourists, but on New Year’s Eve “over-year noodles” are the only choice – a dish that represents wealth and success in the coming year. Hundreds of thousands of tea lovers, experts and tea producers make it to Shanghai for the International Tea Culture Festival. As well as plenty of impressive tea ceremonies, visitors get to taste a good few brands as activities spread around town, attend seminars and visit famous tea spots. Longhua Park is famous for its ancient temple, the Longhua Pagoda, its evening bell-striking ceremony and beautiful peach blossoms. It is especially worth visiting during the Longhua Temple fair, the largest in Shanghai and said to be the day when dragons visit the temple to help grant people’s wishes. Stalls surround the temple and thousands of people go to the booths selling every kind of traditional Chinese food and crafts. The temple is decorated spectacularly, and lit at night to full effect. Every year, on the fifth day of the fifth lunar month, a number of Chinese cities (as well as overseas Chinese all across the world) commemorate the death of poet Qu Yuan in ancient times by staging a Dragon Boat Festival. Usually celebrations go on before and after, but there’s one day of races. Qu Yuan lived as a courtier in the court of the Chou Dynasty until one day he was thrown into the sea after maltreatment at the hands of a corrupt and evil official. When the local fishermen learnt of the poet’s demise, they apparently set to in their boats, trawling the waters to find him. Their efforts were unsuccessful so they threw rice dumplings into the sea, thumping the water with their paddles to prevent the poor poet being eaten by piranhas. An important part of this timeless celebration is the eating of zongzi – the pyramid-shaped dumpling made of glutinous rice wrapped in bamboo or reed leaves. The Shanghai International Film Festival (SIFF) fills various venues around the city, presenting over 900 official films from more than 60 countries. Founded in 1993, it is the only international film festival in China and has Grade-A international status. The nine-day event is made up of four strands: the Jin Jue Award International Film Competition, the International Film Panorama, the International Film Market and the Jin Jue International Film Forum. Also known as the Mid-Autumn Festival, China’s Moon Festival is celebrated around town and especially in people’s homes. Traditionally it marks the end of the harvest season. The festival is marked by the making and eating of “moon cakes” – round pastries filled with sweet fillings. In Shanghai, the favorite filling is a red bean paste. Houses are decorated with colored animal-shaped paper lanterns and altars are piled with round fruits to symbolize the shape of the moon. The evening is spent moon-gazing in the company of family, before enjoying a feast at midnight. The annual Shanghai Tourist Festival offers a huge amount of entertainment at venues across the city. Float parades, markets, a folklore tour of Shanghai Lanes, a Chinese Festival at Yu Garden, and a Music Fireworks Festival in Century Park are part of the festivities. Shanghai hosts a month-long arts festival every year with a varied program of more than 150 performances. This includes everything from symphony orchestras, dance and opera to acrobatics, magic, and drama. Also on the bill are an international piano competition, a magic festival and contest, an Asian music festiva,l and an arts and crafts fair.